The ALT-98 is designed to provide remanufacturers with a detailed test of the alternators in a short time. The user friendly environment makes the setup and test procedure as simple as pressing a button. Thank you for your interest in the ALT-98. Please fill out the form below so we can send you the brochure. Thank you for your interest in the ALT-98. Your request has been submitted to our sales department, and we will get back to you soon. The machine not only tests the product to a preset limit, but has a diagnostic system built in. If the unit does not pass the test the operator is automatically given a detailed explanation as to why the unit did not work. This eliminates the guess work by the operators and even unskilled persons can operate the test unit and make diagnostics of the alternators and voltage regulators. The ALT-98 contains a specialized computer with a digital display, keyboard, variable speed drive motor, battery simulator and programmable electronic load. During the automatic test the computer controls the motor driver and load according to programmable test procedure to verify the alternator and voltage regulator. For a precise voltage regulator check, the car’s on board computer and connection problems are also simulated. Cut-in (turn on) speed, soft start delay, LCR (Load Control Response) function, feedback signal to the on board computer, tachometer output frequency, the rectifier’s voltage drop and reverse diode leakage, the voltage regulator saturation voltage, stator voltage and many other parameters are also measured. When the test is complete, the computer verifies all parameters and prints reports. If the unit is not good, diagnostic messages are shown. Special software for statistical analysis and data collection is available too. For reliability tests and engineering analysis a special long time test mode is included. 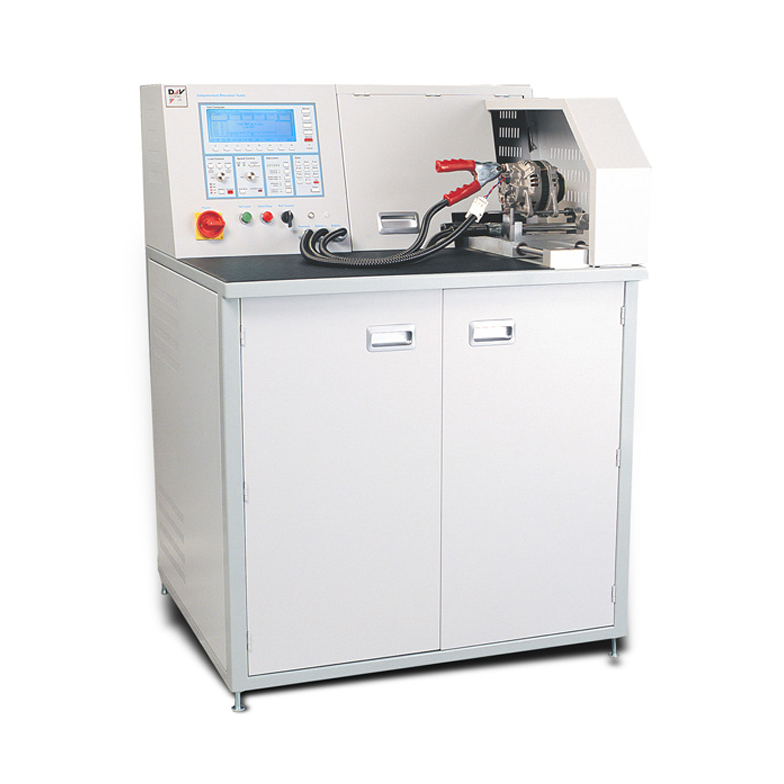 Computerized alternator testing system ALT-98 is supplied with built in label printer port (24 pin), built in RS232C serial interface for data exchange or SPC programming and test plugs for most popular applications. Available in many working voltages (208 to 480V at 50/60 Hz). © 2019 D&V ELECTRONICS LTD.